Wheat Plum – does anyone have any information? I have long wondered as to the true identity of the indigenous damsons around here, particularly the ones around and about my own orchard and garden. Through being involved with fruit identification on the historic Saint Anns Allotments in Nottingham, I thought it about time I tried to resolve this question. The first essential is some good fresh samples, but plum stones are also unique to a variety and can help clinch an identity. If the fruit has gone over stones from under the trees may be used. Simply rub off all the flesh, then wash the stones and leave to dry; they can then be mounted on card. The bible when it comes to plums, damsons and gages is undoubtedly H. V. Taylor’s The Plums of England, long since out of print, but still available in second hand book shops. After comparing the stones against those damson stones pictured and indeed some from the National Fruit Collections at Brogdale, our local damsons are undoubtedly the Shropshire Damson, synonym Westmorland Damson or Prune Damson. 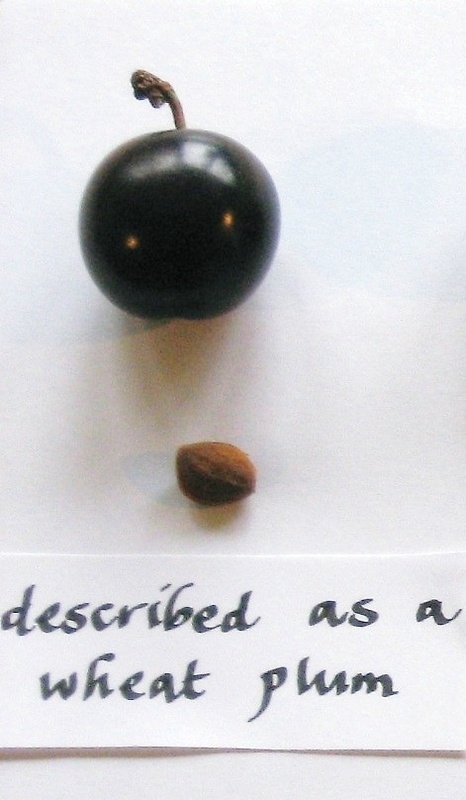 Damson stones from my home village and from the St Anns Allotments site are also Shropshire damsons. Whilst on this quest for local damsons one evening I visited the remains of two orchards. Growing in the hedges there were bullaces, according to the owner, and the last find that evening was alongside an overgrown footpath from Woodborough to the hamlet of Gonalston, which was once a cart track between the villages. Overhanging the track were the remains of a crop of small purple plums. My companion told me his father called them ‘wheat plums’. They were bigger than damsons and more rounded; the stones have been mounted for comparison and future reference. This fruit was identical to an unknown plum handed to me some weeks before on the St Anns Allotment site. Fortunately I saved the stone, which also proved identical. So the question is, what is a wheat plum and what is its origin. Referring to the Complete Planter and Cyderist published in about 1685 and recently re-issued, the unknown author advocates raising stocks for peaches, nectarines, apricots and plums from the stones of the wheat-plum, which is described as a white plum ripening in August. He also says suckers from the wheat plum make good stocks for plums. This name, wheat plum, has obviously been around for some years, but that evening encounter was the first time I had heard it mentioned locally, indeed at all. How Should I Train My Apple Trees? 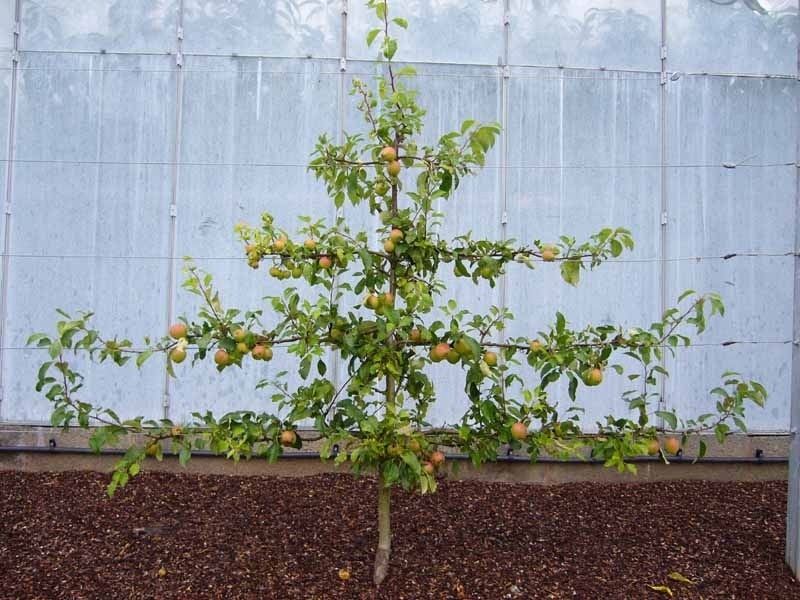 I am planning to plant several apple trees and would welcome advice on the various forms available, for example, espaliers, step-overs, fans, half standards etc. I am particularly interested in the effects various forms have on the crop and the amount of pruning required to maintain them.